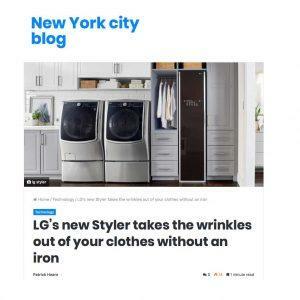 Great article in the New York City Blog on the new LG Styler and its outstanding features. In the article, it is explained how LG washers and dryers are some of the most highly ranked household appliances on the market with their high quality features. It is also explained how the new Styler works on sanitising clothing and remove allergens. LG’s highest quality electrical appliances have passed our strict scientific standards and are CERTIFIED asthma & allergy friendly®.